Perhaps the most stately of Fritz Lang's two-part epics, the five-hour Die Nibelungen is a courageous and hallucinatory work. Its extraordinary set-pieces, archetypal themes, and unrestrained ambition have proved an inspiration for nearly every fantasy cycle that has emerged on-screen since – from Star Wars to The Lord of the Rings. In Part One, Siegfried, the film's eponymous hero acquires the power of invincibility after slaying a dragon and bathing in the creature's blood. Later, an alliance through marriage between the hero and the royal clan of the Nibelungen turns treacherous, with Siegfried's sole weakness exploited. In Part Two, Kriemhilds Rache [Kriemhild's Revenge], Siegfried's widow travels to the remote land of the Huns to wed the monstrous Attila, and thereby enlist his forces in an act of vengeance that culminates in massacre, conflagration, and, under the auspices of Lang, one of the most exhilarating and terrifying end-sequences in all of cinema. Adapted from the myth that was also the basis for Wagner's Ring cycle of operas, Lang's epic offers its own startling expressionistic power – a summit of the director's artistry. 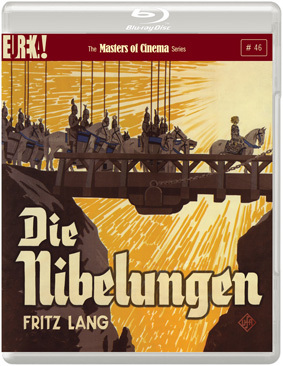 Die Nibelungen will be released on 2 disc DVD and 2-disc Blu-ray in a spectacular new HD restoration by the Friedrich-Wilhelm-Murnau-Stiftung in Germany, in the film's original frame rates and aspect ratio, in 1080p on the Blu-ray released as a 2 x DVD set & a 2 x Blu-ray set in the UK on 29 October 2012 at the RRP of £20.42 for the DVD and £23.48 for the Blu-ray.